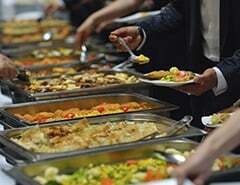 Dobi Catering and Take Out in Leechburg, PA offers buffet and take-out food services for lunch, dinner, and weddings. The following Dobi specialty items are available on most days or when ordered in advance. Some of these items are available in frozen packages for your convenience to heat at a later time. Dobi will gladly heat your frozen selection with advance notice. "best tasting chicken this side of the Allegheny"
Dobi only uses fresh chicken and immediately goes into a marinating process. After marinate, the chicken is either dusted with our signature spices and pressure fried to a golden brown or seasoned with our signature spices and smoke roasted with our signature smoke. Our traditional process produces a crispy outer layer while preserving the moisture in the meat. Our smoke roasted process produces a crisp smokey outer with tender succulent meat. Once you taste either of our chicken styles, you'll long for it again and again, it's that good! Dobi's chicken packages include the breast, leg, and thigh. Wings are sold separately by the dozen and half dozen, prepared in the same manner as our chicken. One of the countries most popular snacking foods. Dobi jumbo wings are marinated and cooked the same as our wonderful tasting chicken, then seasoned or basted with a sauce of your choice. Wings make a great party food. Potato cubes lightly coated with the Dobi special blend of spices. Choose the amount of Dobi style chicken you desire from the list below. Each of our dinners include a choice of two side dishes and biscuit with butter. made weeks ago. Our salads are sold by the pint, quart, and gallon. The yield quantity is approximately two pounds per quart and varies by type of salad. Are you planning a surprise party for your friends? Call us and ask for our free estimates on our dinner buffet services. Click here for our Take Out Menu! Click here for our Buffet Menu! Copyright © Dobi Catering and Take Out, 2018. All rights reserved.